REASI, MARCH 26: District Administration Reasi today organised a mega event under SVEEP at Sports Stadium Reasi. The programme was presided over by Election Observer Jenu Devan and District Election Officer Reasi, Indu Kanwal Chib. The event was focused on encouraging youngsters to vote. A large number of students from Shri Mata Vaishno Devi University and various local colleges of the district as well as locals witnessed the show in which a number of educative and entertaining street plays were presented. Some of the attractions of the show included a ‘selfie point’ where first-time voters could click selfies and share their enthusiasm on social media. A mock polling station was also set up for voters to get first-hand experience of voting on Electronic Voting Machine, EVM with Voter Verifiable Paper Audit Trail, VVPAT. Signature counter and stamp counters were also set up at the venue. DC Reasi, in her address said that the district administration aims to achieve record voting percentage in the upcoming elections. She added that the district administration would go to any length to ensure voting by youngsters, women and the rest. She also highlighted the measures being introduced to facilitate PWD voters in the district. 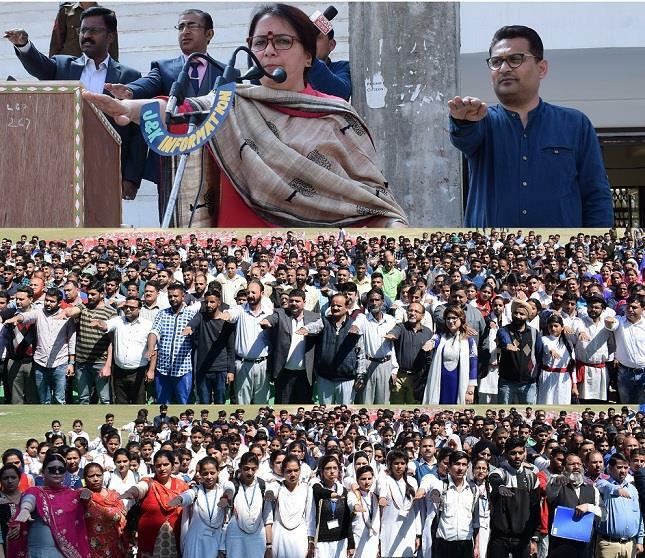 The programme ended with a mass pledge in which college students, locals, district officers and others pledged to cast their vote in the approaching Lok Sabha Elections.